Netflix raised eyebrows with the $140 million budget it handed over to Martin Scorsese recently, but according to a Reuters report, it’s looking to pay out a lot more for some billboard real estate. The move could be seen as an escalation of its cold war with Hollywood. Take one look at Regency Outdoor Advertising’s website; it’s more than clear that this is an old-school company. But in an age of product placement, micro-targeting, and auto-playing video ads, billboards are still an effective way to get your brand name out in front of a captive audience. Netflix loves billboards and Reuters claims it’s competing against other unnamed bidders to take over the Los Angeles-based billboard company. Netflix declined to comment to Reuters on its reported offer of “more than $300 million” bid. We’ve requested confirmation from Netflix, which declined to comment, and Regency Outdoor Advertising, which did not immediately respond. If you’ve been to Los Angeles lately, you’ve probably noticed that currently there are approximately two types of billboards: Weed dispensaries and Netflix ads. Netflix is absolutely everywhere you look. It’s unclear how much Netflix spends to maintain those billboards, but it could see this reported offer as a long-term cost saver. Netflix could also be looking to muscle around the Hollywood establishment in the contest for eyeballs. However, this could also be a defensive move, if Netflix anticipates greater pushback from legacy media companies who have their own ad spaces. Netflix tends to get creative with its billboards, prompting people to share images on social media. Most prominently, the “Netflix is a joke” billboard appeared to be cryptically throwing shade at the company before it was revealed as a promotion for Netflix’s own stand-up specials. 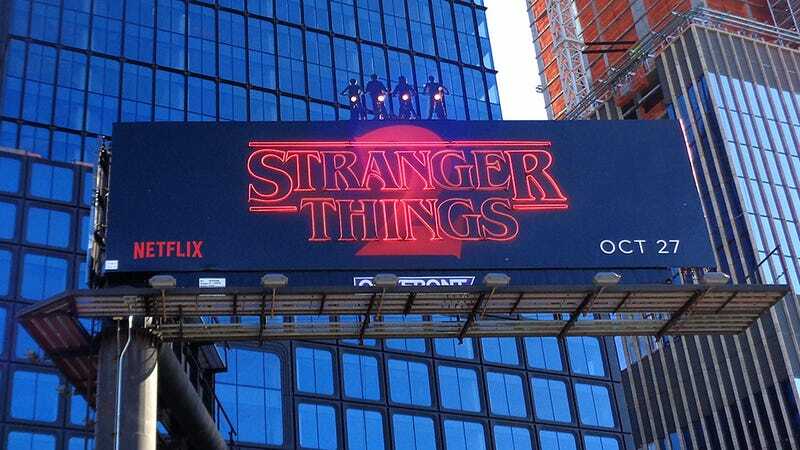 A glowing neon Stranger Things billboard appeared outside the most recent New York Comic Con. And a life-size pod person mannequin was embedded in LA bus stops this year.